Katie Taylor is willing to give up on her dream of ever boxing in Ireland to pursue a super-fight which could earn her a first $1m purse. The undefeated WBA and IBF world champion fights WBO holder Rose Volante on 15 March in the latest step towards unifying the lightweight division. A subsequent meeting with undisputed champion Amanda Serrano would be the biggest fight in women's boxing. "Katie knows TV money makes these deals happen," said her manager Brian Peters. Irish Olympic hopeful Kellie Harrington said it was 'strange' to think that Taylor, a five-time world amateur champion and 2012 Olympic gold medallist, would never fight as a professional on home soil. But Peters stressed it was prime-time television revenue, with Taylor set for a series of fights on the lucrative DAZN platform, which dictated all. "We are all answerable to somebody," he said. "We've had numerous discussions about it and of course Katie would love to fight at home, but she wants to be the biggest and best fighter in the world, and to conquer America. 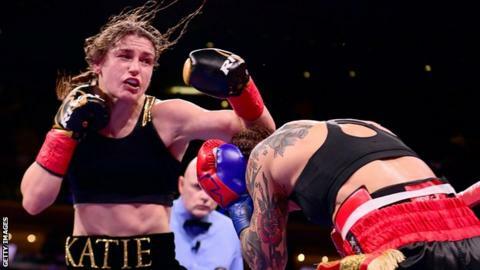 "If all goes to plan, she will be fighting Amanda Serrano later this year and that could see the first fight between two undisputed world champions since the 1930s. "A super-fight like that really would make her the million dollar baby. "It takes money and it needs prime-time TV to make this happen, so I don't think Katie will ever fight in Ireland." Taylor is aiming succeed Serrano as the number one-rated pound for pound women's boxer in the world. Peters believes she will go down as Ireland's greatest-ever athlete and is driven by a desire to keep breaking new ground. "People are so used to her winning that they don't realise how hard she works. "She drove one-and-a-half hours through the snow in Connecticut the other night to get some world-class sparring done. "The pressure and expectation she carries into every fight is phenomenal, but she handles it and is as hungry as ever." Taylor's fight with Volante in Philadelphia will be the co-main event to Tevin Farmer's super-featherweight world-title defence against Dublin's Jono Carroll. Victory should set up a meeting with WBC champion Delfine Persoon in June before a mouth-watering showdown with seven-weight world champion Serrano.